Indian National Congress is going through its worst phase in the history of Independent India. While the grand old party is finding it extremely difficult to find an answer to Prime Minister Narendra Modi's style of politics, the Congress has encountered another huge problem, which is fund crunch. To overcome the crisis, Congress has asked its MPs to donate money for the party, said sources. It is reported that the grand old party has been facing fund crunch since last year's General Elections. It is being reported that many corporates had sensed Congress' defeat in the 2014 Lok Sabha elections and shifted loyalty towards BJP. 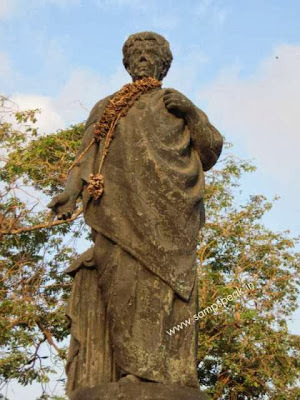 Today [1st Oct] has some connection to Congress and Triplicane too….. through the daughter of William Wood and Emily Morris, born in 1847. Her father, a doctor, died when she was only five years old. Without any savings, her mother found it difficult to care and persuaded a friend, Ellen Marryat, to take responsibility for her upbringing. This girl married a clergy in 1866 when she was 19 – years later, her spirit clashed with the traditional views of her husband – a legal separation followed. She reportedly rejected Christianity and in 1874 joined the Secular Society. In 1877 she and Charles Bradlaugh decided to publish The Fruits of Philosophy, Charles Knowlton's book advocating birth control. They were charged with publishing material that was "likely to deprave or corrupt those whose minds are open to immoral influences". They were both found guilty of publishing an "obscene libel" and sentenced to six months in prison. At the Court of Appeal the sentence was quashed. 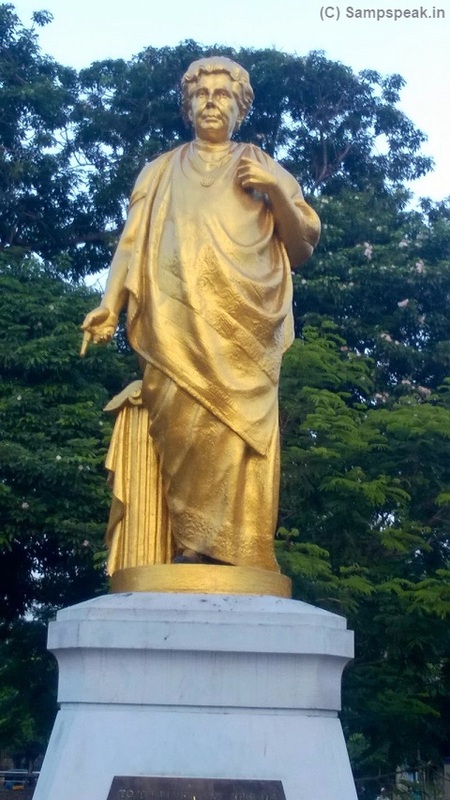 It may not be easy to relate what is written above to the statue that stands nearer Vivekakandar Illam on the Marina beach ~the road that starts from there is also named after her. It is Annie Besant (1847 – 1933) a prominent British socialist, theosophist, women's rights activist, writer and orator and supporter of Irish and Indian self-rule. A couple of years back, when I took this photo, the statue looked forlorn and uncared for. In 1890 Besant met Helena Blavatsky and over the next few years her interest in theosophy grew while her interest in secular matters waned. She became a member of the Theosophical Society and a prominent lecturer on the subject. As part of her theosophy-related work, she travelled to India. In 1907 she became President of the Theosophical Society, whose international headquarters is in Adyar, Madras, (Chennai). She joined the Indian National Congress. When World War I broke out in 1914, she helped launch the Home Rule League to campaign for democracy in India and dominion status within the Empire. This led to her election as president of the India National Congress in late 1917. After the All India Home Rule League, Annie was imprisoned by the authorities. A campaign began to see her released, one of the most prominent of these campaigners was Mahatma Gandhi. She wrote many and was concerned about the health of young women workers at the Bryant & May match factory. In 1988, Annie published an article White Slavery in London where she drew attention to the dangers of phosphorus fumes and complained about the low wages paid to the women who worked at Bryant & May.Three women who provided information for Annie's article were sacked. After strikes, the company was forced to make significant concessions including the re-employment the three victimized women. She founded the Central Hindu College at Benares (Varanasi) in 1898. She herself received a degree in Sanskrit literature, English literature and Indian history from this institution. She continued to write letters to British newspapers arguing the case for women's suffrage (i.e. voting rights) and in 1911 was one of the main speakers at an important Suffrage rally in London. President of the Theosophical Society from 1907, she wrote an enormous number of books and pamphlets on theosophy. She travelled to England and the United States with her protégé Jiddu Krishnamurti, whom she announced as the new Messiah. Annie Besant died in Adyar in Madras in 1933 at the age of 86. After her death, colleagues Jiddu Krishnamurti, Aldous Huxley, Guido Ferrando, and Rosalind Rajagopal, built Happy Valley School, now renamed Besant Hill School in her honour. Besant opined that for centuries the leaders of Christian thought spoke of women as a necessary evil, and that the greatest saints of the Church were those who despised women the most. 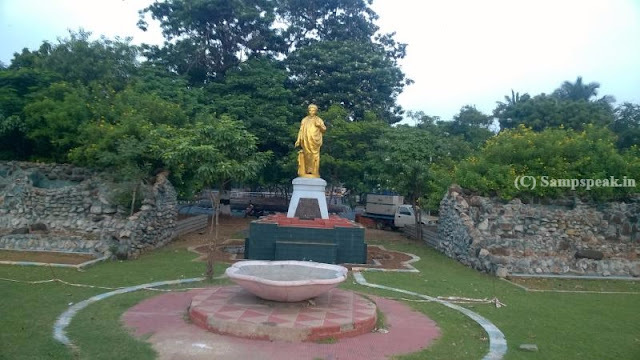 With Marina beach getting spruced up, this photo taken a couple of days back shows the same statue in a much tidier position – though not many still may not know her relevance to the Society and more to the party that ruled India for six decades. Today, Google celebrates her birthday with a doodle !